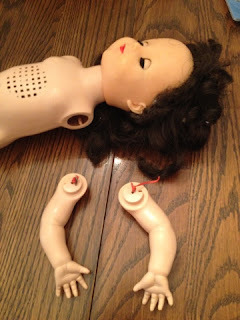 Lately a lot of my readers have asked me questions about re-stringing their vintage dolls. 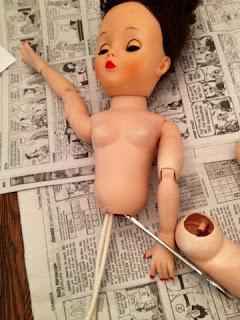 I have a big box of project dolls in various stages of completion, so I decided to photograph myself re-stringing them so you can see exactly how it's done. Before you start you will need to obtain stringing elastic in the proper size. Kits are coming soon to my store. 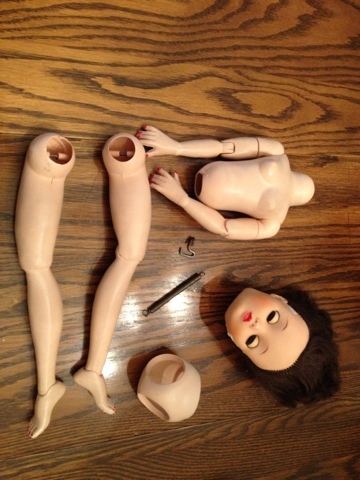 Dolls in need of re-stringing and repair. I tried to restring this doll with a rubber band when I was about 10. As you can see, regular rubber bands don't work. They don't get tight enough and they rot quickly. This one was hard to remove from the arm hooks because it had sort of fused into them over the years. 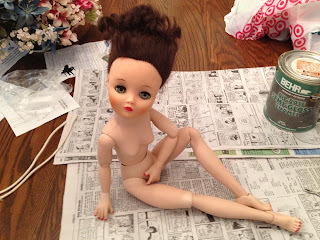 I am starting with Janie's repair because it is very simple since only her arms needed stringing. First I fixed her splits and repainted her sides with oil paint. Then I had to wait for the paint to dry, which took a long time because it has been raining a lot here. 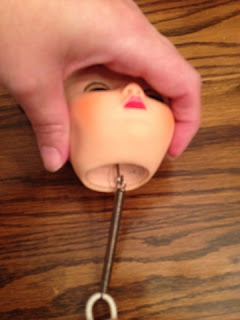 Start stringing by running elastic through the hook on one of the doll's arms. Some dolls will not have a hook , but only a bar. In that case you will need a hook. If you buy a kit as I recommend the hooks will be in there. It is VERY important that you use the same size hooks for both arms or both legs; if you don't the limbs will be lopsided. The tool I am using to hold the elastic is a surgical hemostat. You can get these in various sizes from medical supply stores, fabric stores, or on eBay. They are very useful for many things if you sew a lot or work on dolls because they clamp shut and allow your hands to be free. Step 2: Once you have pulled the elastic through the other armhole, pull it as tight as you can and hook the second arm to it. Test the first arm to see if it has the proper tension. If so, tie a double knot in the elastic or clamp with a hog ring and hog ring pliers. Ease the second arm in and test to make sure it's not too loose. If it is good then cut the excess ends off the elastic. Replace both arms and flex to make sure they are working. Here's a tip: Don't tie the knot right on top of the hook. Try to get it as close to the middle of the doll's body as you can so it doesn't interfere with the movement of the arms. 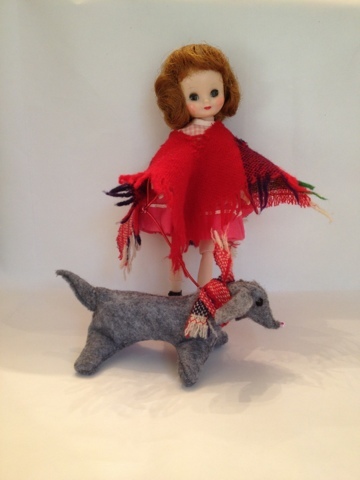 Next, I have a very complicated doll to string. This doll is a Uneeda 2S Dollikin. These are really cool articulated dolls which can hold hundreds of poses. 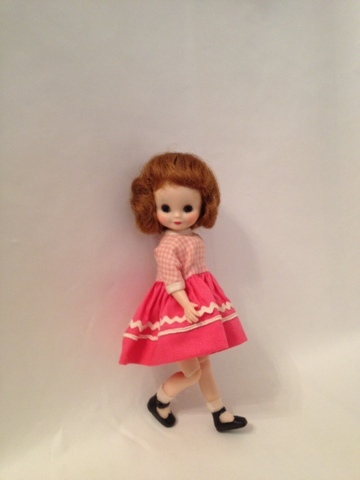 They are from the 50s but very much resemble the ball-jointed dolls of today. They remind me of wooden artist's mannequins. They are not easy to restring or re-assemble when they are broken. I could see the spring needed to run from neck to torso because it was too wide to go in between the legs. Initially, I thought the hook next to the spring was for the torso too, and I was correct, but I wasn't sure how it was supposed to be attached. 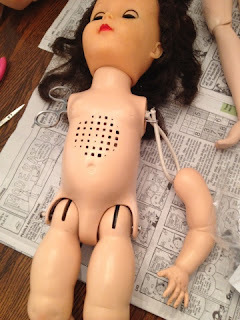 Later stringing of jointed waist dolls revealed they need a knot or hook at the waist so their heads don't fall back. 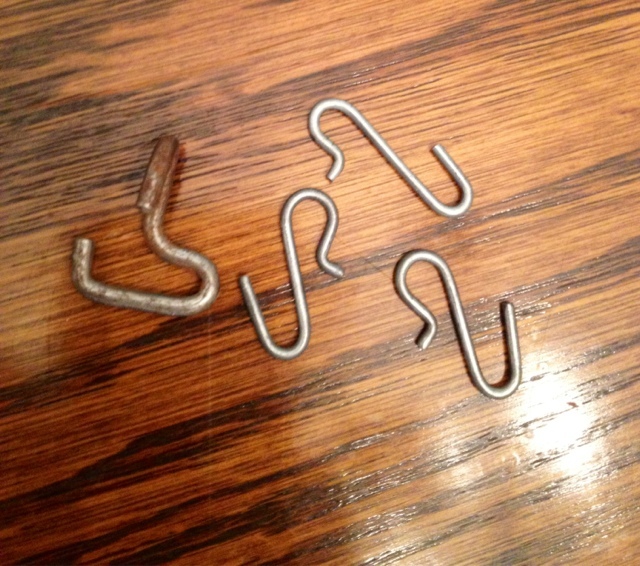 Various arm and leg hooks. 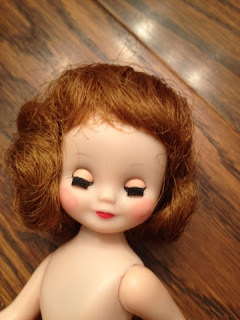 Before I could re-string I had to repair some little cracks and repaint this doll too. Then I had to wait for the paint to dry. She had a hip ball split, but luckily it fits inside the socket, so the repair is not visible. If this doll needed its arms restrung you would do those as I demonstrated on Janie. 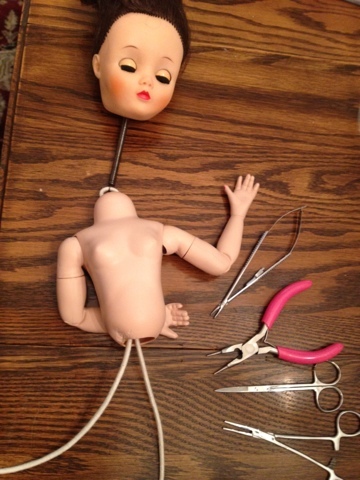 You would do the arms second, after stringing the head and body. So, first attach the spring to the head hook. If you are missing the spring you would use elastic, but you may want to go up a size to thicker elastic to prevent the head from being too loose. The spring hooks onto the head and then to the elastic. If the spring is missing just hook elastic to the head. Now, run the elastic through the body and out the bottom of the torso. Pull very tightly to make sure the head is secure. The pink pliers are jewelry pliers with magnetic tips. These are very useful if you drop a hook inside the doll and have to retrieve it. My head still falls back a little, though it holds a pose, because when I did this doll I wasn't aware of the need to knot or hook the elastic at the waist. I tried just using the smaller elastic, though, and that was worse. 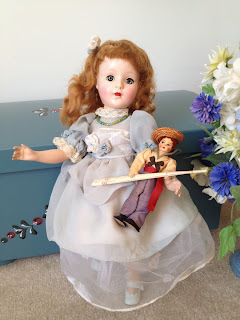 With any vintage doll I find the manufacturers did things all different ways, even in the same dolls, so you often have to experiment and make up a solution to a problem. After you string the torso secure the elastic and get ready to add the pelvis. The head and torso are strung. Add the pelvis and attach one leg to the elastic and then the other. DO NOT tie the knot in between the legs in the crotch or on a hook. Tie it on the side. Tie the knot after you have tested the legs just as I did the arms in Janie's demo. Cut the ends after you make sure the elastic is tight enough and then replace the second leg in the socket. Getting ready to tie the knot. Now Dollikin is herself again! She can pose all different ways and even stand alone. 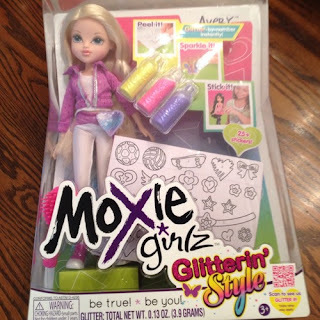 These are such neat dolls! Dollikin can hold lots of poses. 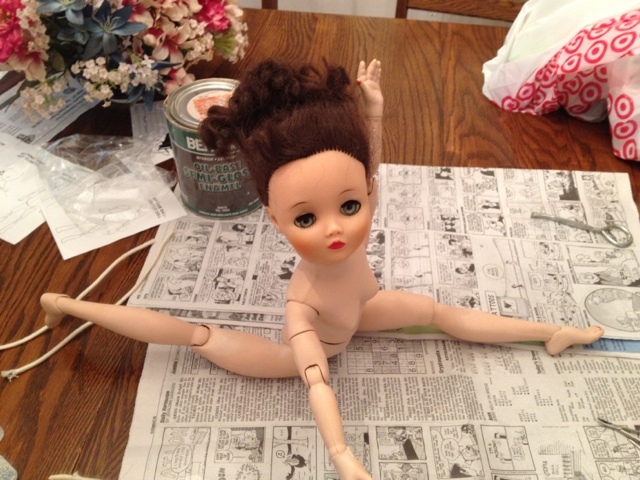 These dolls make great gymnasts or ballerinas because of how they can pose. Now Janie and Dollikin just need hairdos and clothes and they'll be ready to go! Moxie Girlz are for sale in my new store. Well, I finally did it: I opened a real eBay store! Usually I just try to get by with my 50 free listings, but a recent Target toy and doll clearance sale overloaded me with new inventory and I just didn't feel like sitting on it until Christmas. Besides that, eBay is making some changes to their policies, which means my blujay store, the original Atelier Mandaline, is going to have to change or disappear. Right now I list the same items in both locations, just for the people who are against eBay for whatever reason. It's funny, because everyone is all about Etsy right now, but I've been selling on eBay long enough to remember when they spun Etsy off. That's right; it's an eBay subsidiary! Not that there's anything wrong with Etsy; I have an Etsy Atelier Mandaline in progress. I don't have enough handmade inventory to fill it as yet. I just think it's funny that one site is so much more hip when it's really all the same company. Anyway, now eBay is going to start charging you for ending listings early. Right now I list on blujay and eBay and end a listing as soon as it sells on the other site, but I will have to stop that. I also have most of my inventory set up so you can make an offer instead of paying the listed price, which is a fun feature eBay offers sellers. I am a little worried about paying to open a store front and paying for more inventory, but you always hear that you have to risk something to gain a lot and I'd like to take my store to a higher level. I had a hard time deciding on a store name. Atelier means "studio", but is often used to describe a teaching artist's studio. I felt it was appropriate, since many of the items I sell are handmade and I do try to give instructions for lots of projects on my blog. I thought "Atelier Amanda" sounded really nice, but then it wouldn't tie into my blog or my other store. I have a lot of toys and dolls straight off the shelf, but I also sell many of the dolls and other projects I show in this blog. Sweet Sue Visits Venice is for sale, as well as some My Friend doll and book sets. I also have lots of clothes and shoes in size 2 to adult, some really nice handbags, dishes, and beauty products. EBay suggests you name your store for the products you sell, but Amanda's Dolls, Books, Beauty, Bags, etc, doesn't sound good! I also want the chance to change my inventory later. 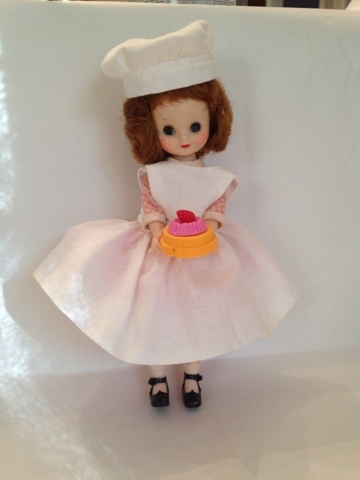 This Sweet Sue is among the vintage dolls for sale in my store. Someday I hope my blog and the Atelier Mandaline brand take off enough to support a stand-alone store, but until then I am working hard to grow my eBay store to the utmost! I hope you will visit at http://stores.ebay.com/atelier-mandaline and subscribe to my store newsletter as well as follow this blog. I want to thank all of my readers, and especially all of you who purchase my items and write to me to tell me how you love my work. It just makes my month to hear from you! Chinese foods: dragon fruit, lychee, and steamed vegetable buns. Today I am back to working on myself again, now that I finished Charlie's project. I did well the first month of my plan and lost 5 pounds, but since then I haven't gotten the scale to budge. I knew going home for Grandma's funeral would be hard, in part because I am an emotional eater and in part because funerals and family gatherings equal a perfect storm of food temptations. So, the fact that I was able to keep from gaining despite eating WAY too many servings of Mercer County style Amish chicken and noodles (a dish that doesn't exist in the South), is pretty good. I must be doing something right, too, because people keep asking me what's different. "Did you change your hair? ", they ask. I didn't, so my lifestyle changes must be starting to show. I have worked on my skin some, though. Since we came back home Mom and I went to get our faces and chests treated with lasers to remove sun damage and lines. I didn't have much in the way of age spots or wrinkles, but I have a chronically sunburned look, especially on my chest. My life spent in sunny spots like California and North Carolina really shows in my Scandinavian skin, even though I have the yellow type so euphemistically called "golden". For the past few weeks I've had black spots that came out and puffiness from the laser treatment, but now that's going away and I am happy to say my face looks really good. My mom said it looked "poreless", which is a big compliment. She's the one who bought me the laser treatment for my birthday and she's always giving me big bags of anti-aging creams, so I think she not-so-privately believes I look like hell! My chest is still slightly pink, so I hope it improves without me having to get another treatment. Besides that, I started a new exercise program I found on Pinterest. It is from Prevention and it was tested at ECU, my alma mater! I am only on day two, but let me tell you, this plan looks simple and easy but it is HARD! I am so sore I can hardly move. It's rather embarrassing. I do a lot of walking and yoga and have even started training with some of my friends from church who are doing a half-marathon, plus I am always doing difficult household chores, like carrying sleeping toddlers and lugging vacuum cleaners up and down stairs. I am really surprised to find these "eccentric" exercises so hard. If you want to try the plan the link is http://www.prevention.com/print/26102. It only takes about 45 minutes a day and you can break it up into two parts. Let me know if you decide to try it and how you do! Years ago, in my twenties, I did the Body For Life program, and this reminds me a lot of that plan. That plan works really well, too, but I don't like having to eat six times a day, as you do on BFL. It's just too much food prep. The exercise plan is helpful because I have been having a really hard time lately. Besides my grandmother's death, I just feel out of sorts for many reasons. It is so hard not to be at home and to not have a home. The children are upset, especially our youngest. He asks every night at bedtime if he can go home. We show him the new house, which finally has a foundation and walls, but of course it isn't done yet. Our cat ran away the first week here and we haven't been able to find her. Plus, everything is just so crowded and different. My parents buy everything high-end, so even the refrigerator is digital. Right now it is freezing everything and we can't figure out why. Unfortunately, my parents never read instructions and then lose them or let dogs chew them all up, so they can't tell you how to operate anything. They have all these new flat televisions and some digital package with about 10,000 channels. I rarely get to watch anything all the way through because someone usually walks in and turns the channel or starts talking really loud so I can't hear. I do try to go in the basement is I want to watch something or to do my Just Dance wii game, but the kids change all the buttons playing video games and DVDs, so then I can't get it to work. Now Jerry is mad at me because he had to go downstairs and fix the T.V.and then the next day he wanted me to do something on the computer and that wouldn't work. So I can't ask him to fix the fridge, or look at our daughter's Story Buddy rabbit, which has stopped working even though it's less than a year old. Of course these things work fine for Jerry. I wonder sometimes if I emit some sort of magnetic energy that messes up electronics. My fitbit, a replacement of the first one which fell apart after one month, is slowly dying. Tonight it only gave me 5 points on my earndit challenge, even though I have walked more than yesterday when I got 38 points. So now I will have to save up for a new fitbit, as well as all the other things we need. Last week I bought a gallon of milk and later found it leaking all over the fridge, because it had a tiny invisible hole. We cleaned it up and poured the milk into a pitcher and forgot about it until yesterday when we got in the car and found it smelled like death. Evidently, the milk leaked in there on the way home from the store. We've spent two days cleaning it and it still smells. I know the French lady is rather against exercise plans besides walking and stair climbing, but I think since this one avoids the gym and fitness machines she would approve. Besides that, I am a person who craves time alone and quiet and right now I have been finding myself fantasizing about just driving away until I find an deserted beach with an empty hotel room somewhere and just checking in forever. 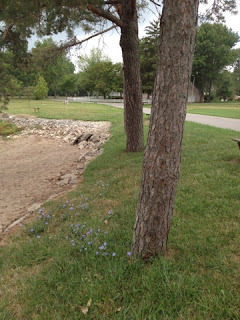 So, it is good for me to get out and do my workout and feel like at least I have control over something! I do agree with her, however, that it is hard to keep your calories down when you do a lot of exercise. Today I woke up starving! Another misstep in my French plan is that I have been committing a big no-no: I have eaten the same lunch for weeks and weeks, or at least nearly the same. I was lucky enough to find some smoked whitefish just like that from Michigan here in N.C., so I've been eating a LOT of it. Then too, I almost always eat a big salad, usually baby spinach, with whatever else I have. Well, yesterday I just couldn't face the thought of another bite of salad! So, we headed to the Asian grocery to pick up some seasonal Chinese produce I've been missing. 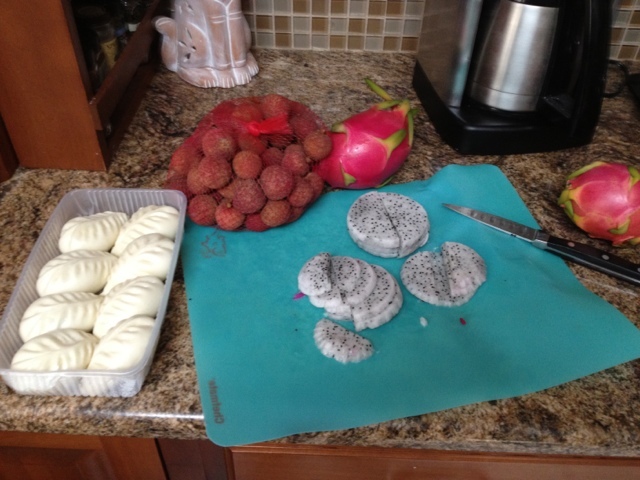 We got some luscious dragon fruit and lychee, and of course I couldn't resist the steamed buns. The vegetable-filled ones have a little over 100 calories each and they are only $1.59 for 9 buns! I have made these myself in the past, but they are very time-consuming and mine are never white enough, and buying them costs less. We also picked up some tapioca pearls, or "boba", to make Bubble Tea. I fell in love with Bubble Tea in Reno a few years ago and haven't had it since. I thought the kids would love it. You do have to be careful with young kids and give them a spoon, rather than a large straw, so they don't choke. When I discovered boba, which is cassava root, they were all black. Now, though, our Asian grocery has multi-colored ones like pink and blue and green, as well as white. I went with the white to avoid any added coloring. We made one jasmine tea and mango juice drink yesterday. 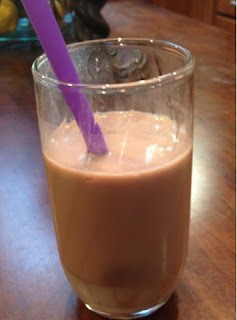 Today we tried unsweetened chocolate almond milk. I really liked that; it tastes like iced coffee. You may remember I am trying to give coffee up, so this could really make a good substitute! 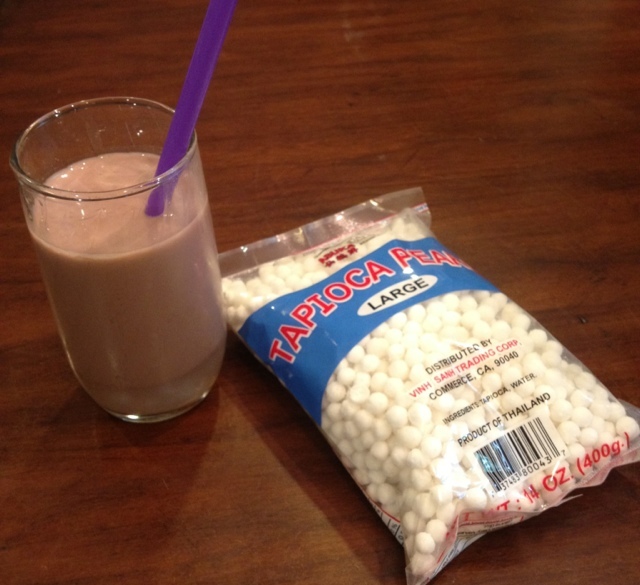 Tapioca Pearls and "Bubble" drink. The Cassava "bubbles" are at the bottom. Having a bit more exotic food has made me less bored and less likely to snack on junk food. I have been eating a lot of the Chinese fruits, more fruit than I was eating. Going to work out at night has also limited my wine consumption, a good thing, because stress makes me want to drink wine as well as live on empty beaches. 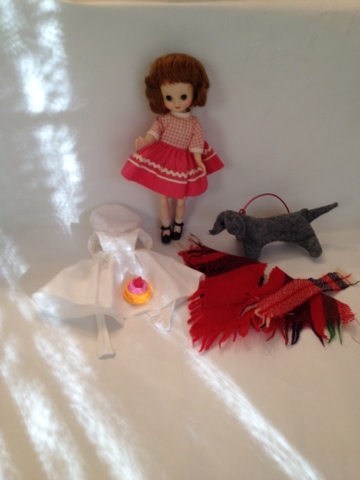 Soon the kids will be back in school, so I will try to get more dolls and things done for my store. I finally got around to working on another project this week. I haven't written anything for the past couple weeks because we've had a hard time and I just haven't been ready to put it all down yet. On July 24th my grandmother died. This is my mother's mother, the one we moved home to live with after my father died. I've really been missing my grandmother since before Christmas, because around then she stopped being herself and has been going downhill rapidly ever since. She had gotten to the point that she hoped to die, and so I am happy for her that she is at peace and somewhere better now. But, as always in a case such as this, I still can't help wishing I could go back in time when all my grandparents were alive and well and I could go home again. This last trip is the last time we will stay in my grandparents' house, with all its familiar furniture and paintings and everything uniquely theirs. Now they are all gone. It is nearly impossible to believe. 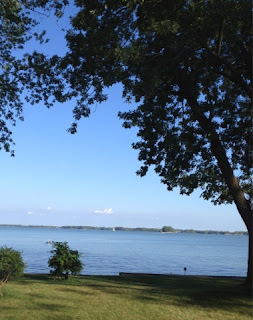 My grandparents lived on this lake. I know we have been lucky. My oldest child can remember all but one of his great-grandparents. Our middle one can remember two of them, and our youngest may be able to remember one. We had them for many years longer than most people can hope to live, and they were healthy until the very end, or close to it. Really, my grandmother was only very sick for a few months before she was able to go. I'm also not sure they really are completely gone. On the day of my grandmother's funeral, as we drove to the church, an old man wearing a car cap rode past on his bicycle and gave us a jaunty salute. I burst into tears. My grandfather, my mother's father, rode his bike all around town every day, including the morning of the day he died, always wearing his car cap. I can't help feeling he sent that man across our path. It was actually wonderful to be back home again, despite the sad circumstances. Ohio in summer is one of the loveliest places I've ever been. We were home in time for the Lake Festival, and got to watch the fireworks as they burst over the lake, duplicated in the water. The light lasts so long up there, it was after 10:30 at night before the fireworks could start. The air was so cool, in the 60s. Far across the water we could hear the music and festivities. Earlier in the evening I was able to see one of my favorite flowers, chicory, blooming. I always think chicory in bloom looks like pieces of heaven fallen to earth. I hated to leave, but of course we hadn't planned on a vacation at this time and so Jerry only had so much time off work. We made the long trek home, and on the way my niece, who has a virus, infected everyone. So we spent the past week coughing and napping. 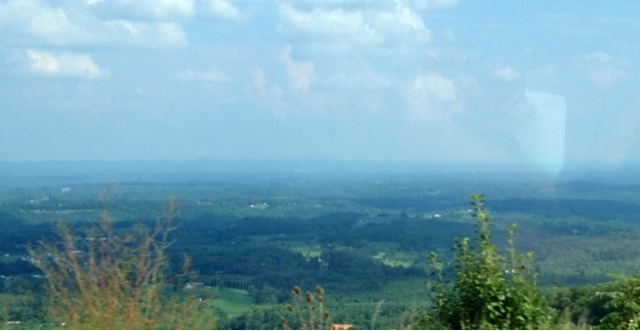 North Carolina, as seen from the Virginia mountains. Since my grandparents invested much more of their riches in children than material goods, there isn't much to divide. I took home the Viking ship plaque they kept over the fireplace, and my daughter got a tiny ceramic mermaid, the Little Mermaid from Copenhagen. I remember when my grandparents brought it home from a long trip to Norway to stay with cousins and around Scandinavia. I loved it at the time and thought it so beautiful, and I am happy to find my daughter loves it too. 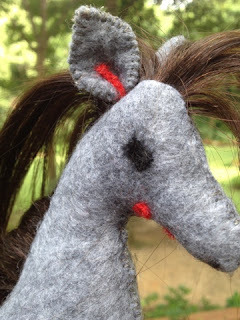 That made me think of the wool horse they brought me from Iceland, a souvenir of the same trip. Horses are important in Scandinavian art, and they all seem to have a certain look, from the Swedish Dala horse to my little wool pony. It was a funny coincidence that I thought of that, because my sister called with a strange request a few days later. If we had a difficult trip, my sister's was epic. It happened that the day before my grandmother's funeral was her husband's grandmother's 90th birthday party. Her trip involved driving to Baltimore, flying out of D.C. to Dayton, flying back to D.C. and then driving back to North Carolina with their two young sons in tow, all in around four days' time! Even worse, my nephew, Charlie, has only one soothing mechanism: holding on to his mother's hair. So my sister had to ride the whole way down 95 leaning over her seat so Charlie could grasp her hair! My sister hoped to find a toy with long hair for Charlie. She thought it would need to be human hair so it feels right, and it would need to be safe enough for an infant under the age of one year. A tall order! She decided on a horse and asked if I thought I could find human hair to use. 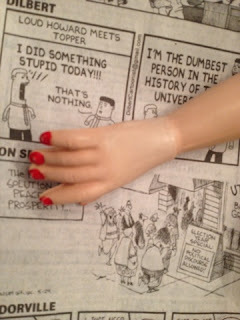 Well, I already have human hair extensions in several colors, the upside of making dolls! I use hair extensions that are wefted, the kind you get from beauty supply stores. I had my sister buy some wool felt in the color she wanted and then I got on Pinterest and looked for inspiration. I had my little Icelandic pony in mind. That horse has the same straight lines as a Dala horse, but big long eyes and a very fuzzy mohair mane and tail. I wanted a little more whimsical look so the hair would fit in better. 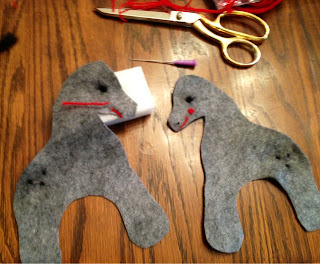 I eventually found a free giraffe pattern from Woman's Day, and I adapted that template so it looked like a horse. You can find the template at http://www.womansday.com/home/craft-ideas/craft-project-toy-giraffe-103593. The original pattern was a giraffe. After I redrew the pattern and cut the pieces out I wanted to add features. I wanted the horse to have a smiley mouth, red cheeks, and black button eyes with long lashes. However, since this is a toy for an infant it is not a good idea to sew on buttons or other things which could dislodge and choke the baby. So, I decided to needle-felt the features. 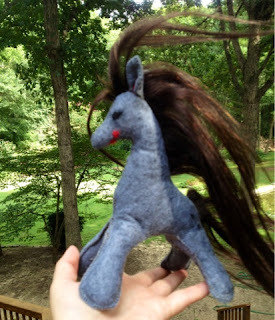 You can see step-by-step needle felting instructions on some of my other entries, including the Loving Lenci post. Here, I used wool roving for the eyes and red wool crewel yarn for the mouth and cheeks. To make the eyes look like they have long lashes I just didn't felt the black roving all the way down on the upper edges of the eye. If my sister has to wash the horse those will just felt down into the eyes, but for now it's really cute! 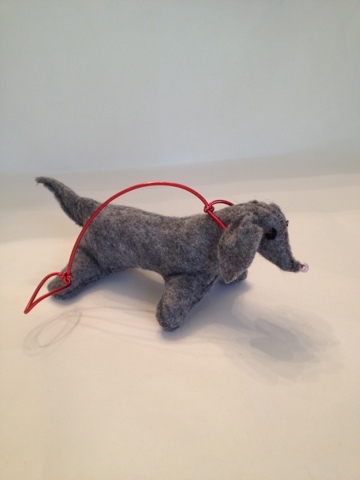 Eyelashes are made by leaving the roving at the top unfelted. I wanted to sew the whole horse inside-out and turn it, the way you normally would. However, when I tried to turn it the fabric was too thick and it was tearing. 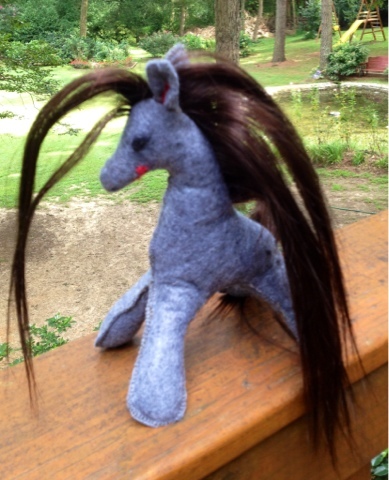 For safety's sake I sewed the wefted hair inside and turned the horse right side out. I sewed everything else with blanket stitch. I hope the small size will be perfect for Charlie's little hands to grasp. The horse is small for infant hands.